It has long been recognized that safe and efficient maintenance is an important component of effective wind turbine asset management. Interior wind turbine lighting for inspection and maintenance purposes plays an important supporting role in these efforts. However, interior lighting systems that perform poorly, or require high levels of maintenance cannot effectively contribute to asset management efforts either in a supporting role or as asset management class. Fluorescent lighting has been the technology most often used to illuminate wind turbine interiors. From an asset management perspective, fluorescent lighting systems present a number of operational challenges. Though long lived, fluorescent bulbs must be replaced periodically during the lifetime of a wind turbine installation. In addition, fluorescent technology performs poorly at the low temperatures often seen in wind turbine applications, requiring the use of special fixtures with heaters for effective operation. For emergency back-up purposes, typical practice has been to use fluorescent fixtures with on-board batteries, which also require periodic replacement. 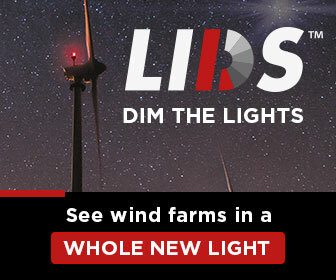 The distributed nature of wind turbine lighting installations, plus the need for periodic replacements, results in tangible labor and material expense. Failure to perform the required service will result in the poor performance of interior lighting, negatively affecting safe and efficient maintenance. New, purpose-built LED lighting fixtures have been used effectively in interior wind turbine applications. 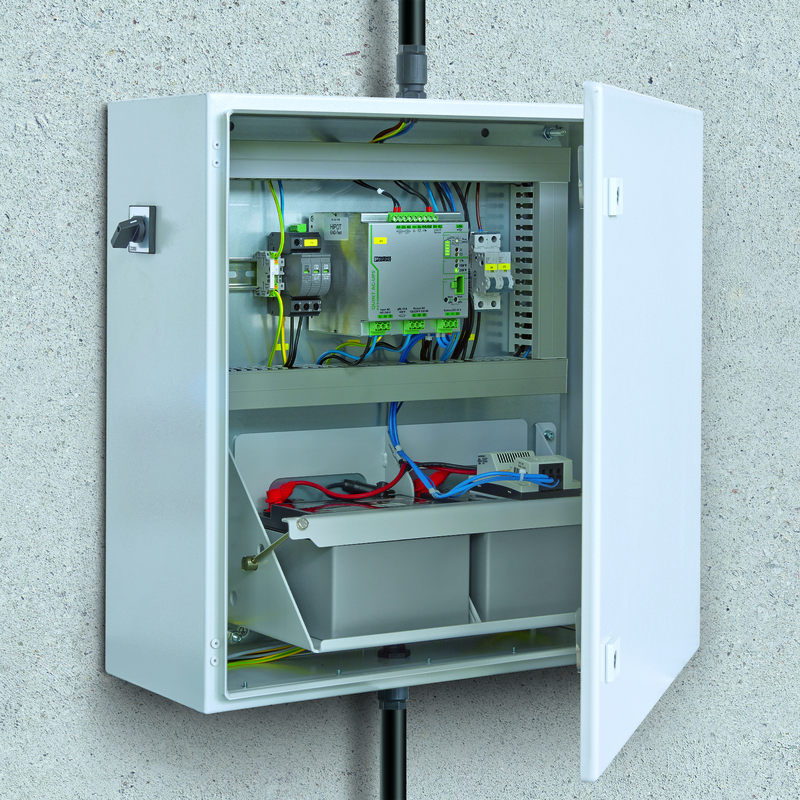 Coupled with a central UPS for emergency back-up purposes, these systems offer significant operational improvements over fluorescent technology, with the opportunity for a lifetime wind turbine installation, with little or no maintenance. 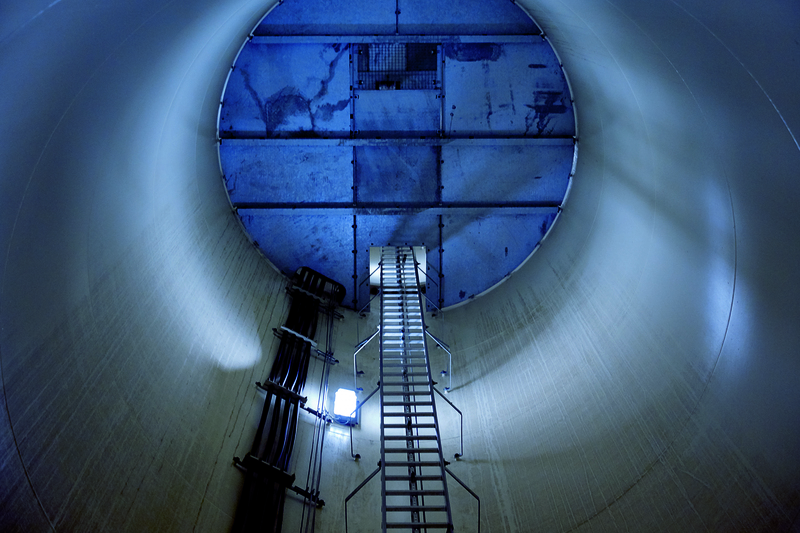 In wind turbine applications, LED lighting offers many advantages for interior illumination. LED fixtures are typically smaller than the equivalent fluorescent fixture, allowing more efficient placement within the interior confines of a wind turbine. While both fluorescent and LED technologies offer IP67 water- and dust-tight ratings, the typical 50,000-hour life expectancy of the LED means that the fixture can be sealed for life, and does not have to be opened for bulb and battery replacement. LED fixtures are typically more robust than glass-tube fluorescent fixtures, so they can withstand rougher handling during the installation process. They are also more robust from an electrical standpoint, offering built-in surge suppression. From an operational temperature perspective, they offer specifications of -40 to 70 degrees Celsius, eliminating requirements for special heaters needed for low-temperature operation. LED fixtures can offer specific lighting profiles for both ladder and platform applications. For wind tower interior lighting, LED power consumption is around 10 watts per fixture, resulting in a low lighting supply current requirement. Typical practice in the wind power industry has been to use lighting circuits at either a nominal 120 or 240 V AC, 50/60 Hz, depending on the voltage mains of the country of installation. With 10 W power consumption and a nominal 240 V AC supply, a 100-meter tall tower with a typical 20 LED fixture installation will require a supply current of less 1 A. This permits the use of cost-effective cables with wire sizes as low as 1.5 mm² (16 AWG). Fixtures are also available with a wide-range AC input that covers voltages from 90 V AC to 260 V AC, permitting global application. LED lighting fixtures requiring a nominal 24 V or other low-voltage DC supply are also available. However, the necessity to use larger, more expensive wire size cables to reduce voltage drop can be a concern. Sealed fixtures and low-current consumption make it practical to use a central emergency back-up UPS in LED interior lighting applications. 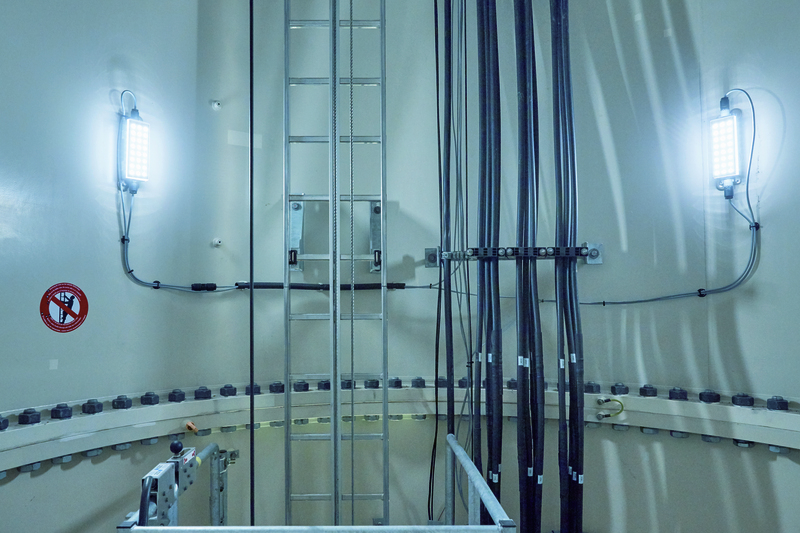 The UPS is installed at the base of the wind turbine tower, and supplies AC power to lighting fixtures. When used with a 15-year long-life battery, UPS service requirements can be both convenient and infrequent. Features such as alarming, operational status, battery health monitoring, and remote operation are added benefits for asset management. LED lighting is suitable for both new and existing interior wind turbine applications. From a lighting design perspective, EN 50308 is one of the most commonly cited criteria. This standard requires a lighting level of 10 lux for ladders, and 50 lux for platforms. For new installations, lighting manufacturers can provide light-fixture location surveys based on interior drawings of the wind turbine. For retrofit applications, where a drawing might not be available, sketches of existing turbine types can be provided for lighting survey purposes. For either installation type, results can be field-validated using light meters on a prototype basis, to determine if any adjustments are required. To enable faster wiring times, LED fixtures are available that use insulation-displacement connectors. These allow fast wiring with the minimal use of tools. For new installations, pre-assembled cables are most common. For retrofit applications, as much as practical, the use of existing wiring is typical. Extension cables can be formed using the insulations displacement connectors found on the LED fixtures, to accommodate different light locations and wiring requirements. For mounting, LED fixtures typically have brackets that can be adjusted to meet the mounting location requirement. For certain locations with steel towers, high-strength magnetic mounting can be used. The light weight of LED fixtures is an advantage in this method. LED interior wind turbine lighting systems have been installed globally, as the successor to fluorescent technologies. From an asset management perspective, elimination of fixture maintenance, and significantly reduced UPS maintenance, results in meaningfully lower operating expenses for interior lighting. 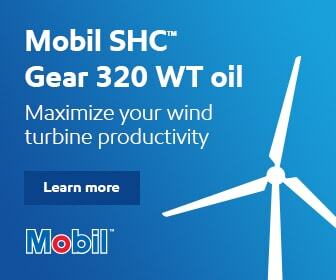 The improved performance of these systems also allows them to play a more effective role in supporting the inspection and maintenance activities of other wind turbine systems; they offer significant benefits in wiring, installation, and operations, making them a suitable choice for new and retrofit interior wind turbine applications. Graham Zimmerman is Business Development Specialist for Phoenix Contact USA. He recently spent over 2 years in New England as an Industrial Sales Engineer, focusing on OEM’s, System Integrators and End Users in industries including Water/Waste Water, Manufacturing, Solar, Oil & Gas and Electric Utility. He has a BS in Mechanical Engineering from Penn State University. Daniel J. Sylawa is Senior Business Development Manager – Renewable Energy for Phoenix Contact USA located in Harrisburg, PA. 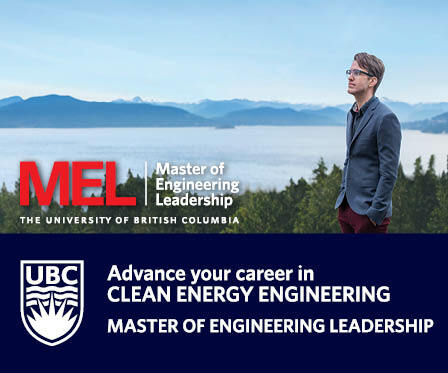 He has over 30 years of experience in project management and business development in the electric power, energy storage, renewable energy and industrial automation industries. He has a BS in Engineering from Drexel University in Philadelphia, PA and a Master of Engineering in Instrumentation and Process Control from Villanova University in Villanova, PA. He is a member of AWEA, IEEE, DNP Users Group and ISA.